A Geological Safari - we visit the Hoba Meteorite which is the largest meteorite to have been found in the world. The Birth of Geology - visits the site of the Lairg Meteorite and we visit a coastal site where tectites can be seen. Gold, Diamonds and Mammal-like Reptiles - visits the Tswaing Meteor Crater and the Vredefort Meteor Impact World Heritage Site. Yellowstone, Dinosaurs and Grand Canyon- visits Meteor Crater, which is the best preserved example of a meteor crater in the world. 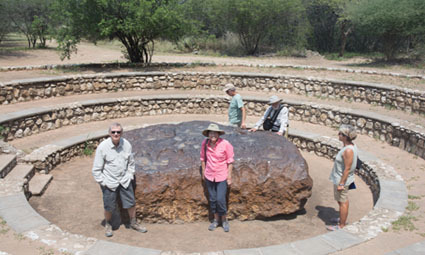 The largest meteorite found in the world, visited on our tour in Namibia.